The Ghost of Newborough Bar. In the Middle Ages Scarborough had a wall around it. The wall had gates and ‘bars’ used for checking who was entering and exiting the town. The difference between a gate and a bar is that a gate is on a hinge and a bar is an obstruction or a barrier. A ‘bar’ for serving drinks is called a ‘bar’ for this reason, it is barrier to control the sale and the serving of alcohol. According to the French writer Michel Foucault the purpose of the gates, bars and town walls of the Middle Ages was, “ to symbolise the boundary between the community and the spaces of exclusion”. He describes a time where towns and cities in their infancy would strengthen their small communities by excluding everything they didn't want or what they didn't understand. ‘Exclusion’ was to be put out of town, beyond the walls. This could mean getting rid of the bi-products of town life, like food and household waste, but it also could mean people with problematic behaviour or unaccepted views or people suffering from diseases. ​"There were lunatics in the middle ages but modern psychiatry is helping us understand that madness itself may be a form of protest against social norms and that the 'lunatic' may in some sense turn out to be snare than the society which rejects them". - Christopher Hill, World Turned Upside Down. This approach encouraged suspicion and fear of the areas of exclusion as well as having a profound affect on the cerebral landscape as well as the physical landscape. Just as decisions affect the structure of the places we live, and the places we live affect the way we think. The land outside the town walls became the ‘wilderness’, inhabited by the ‘uncivilised’. Separation encouraged suspicion and xenophobia - the fear of strangers. The grotesques figures and carvings originally found on the outside of churches from the 12th to the 16th Century, became known as ‘gargoyles’. Half human and half fantastical animal, they originally represented the twisted, tortured souls of the dammed, who were barred from entering the sacred space inside the church. 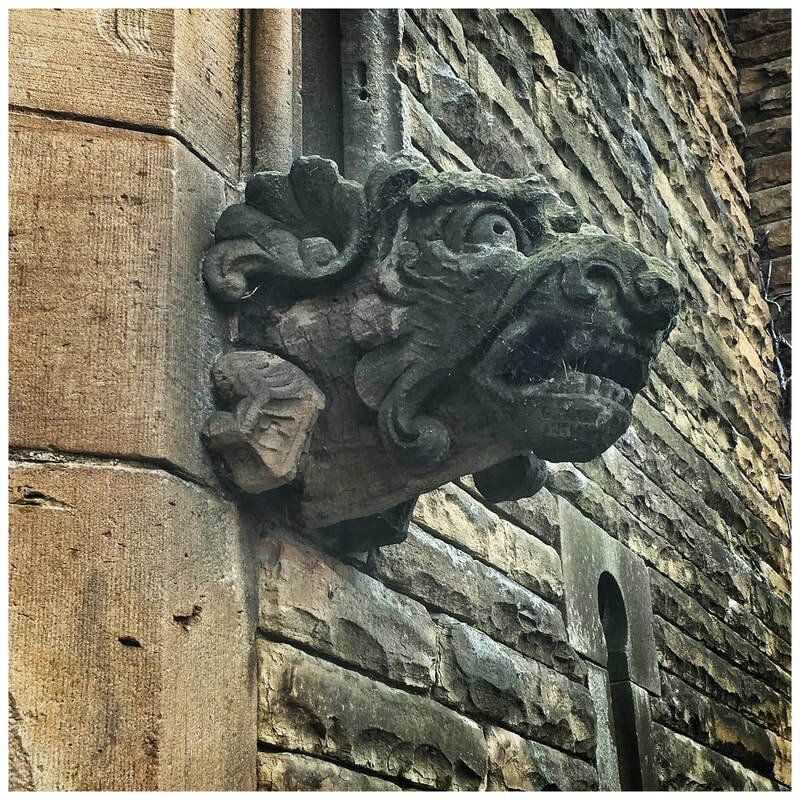 ‘Gargoyle’ is a name that stuck later, from the Old French word meaning ‘gullet’ or ‘throat’, as the figures were later used as part of the ends of guttering - as water spouts. Look at the only gargoyle on the side of St Martin’s Church on South Cliff for example, sat above the down pipe. Gargoyle is from the same root word as ‘gargle’. 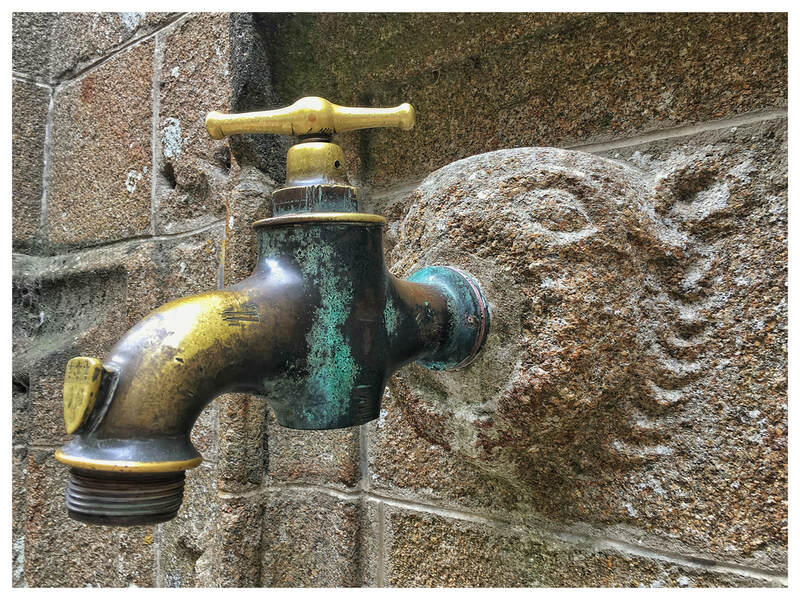 Most important structures during the medieval era contained at least one featured gargoyle as a gargling water spout. Follys such as Dean Road Jail has two gargoyles either side of the entrance and up on the twin turrets. “Originally used for teaching how we can be corrupted and become prisoners to folly, their wan smile is anxiety in the form of an agile grimace. ” - Foucault, Madness and Civilisation. The gargoyle transformed from a damned creature stuck in limbo on the outside of churches and cathedrals, now have come to represent our anxiety and fear of the unknown. The gates in the town wall included the Newborough Bar, the Auborough Bar, West SandGate, East Sand Gate and the Barbican Gate at the Castle. The town wall and a dry moat, an earth work that became known as 'the ditch' (See also article called "On Lady Edith's Secret Service) which circled the town from the harbour to Bar Street to the Castle Barbican. 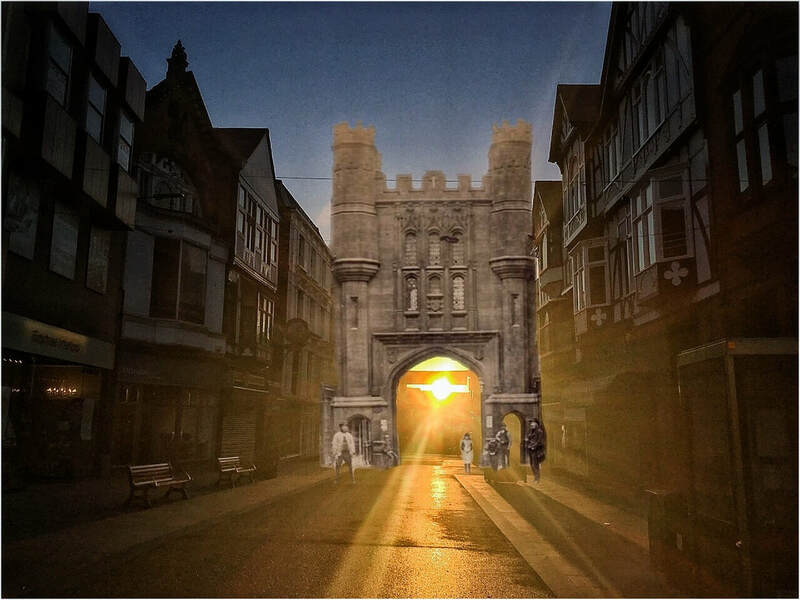 Streets like 'Longwestgate' as they became known as streets with 'gate' in their title because they led to a gateway exiting the town. In the 1500’s, John Leland, the father of local English History, described the Newborough Bar as ‘meately good and the Auborough Bar as ‘very base’ and a very flat affair. It is not known when the Auborough Bar crumbled away but the foundations of it were uncovered in 1812 and there is an old print of its arch still standing in the early 18th Century. Much of its stone was reused to redevelop the houses on Auborough street. I feel that Lelands description is contradicted by the various paintings and etchings of both gates as I find the original Newborough Bar (not the later gothic folly) to be quiet domestic and homestead, where as the images of the ruin of the Auborough (Oldborough) Bar to be a genuine defensive gothic structure, with pointed arches and plain battlements. Historian Dr M Andrews briefly describes the West and East Sandgates as gaps in the old wall along the foreshore. Repairs to a small bridge across the Dam Geth Stream is mentioned in the town records but there are very few descriptions of what the entrances to the town from the sea actually looked like. Historian Joseph Brogden Baker speculated that the old town might have started as two Saxon settlements, centred around the areas Tut Hill near the harbour and Dumple the area at the bottom of Tollergate. ‘Dumple’ is derived from ‘Dun’ meaning fortified hill suggesting an enclosed communities prior to the ancient town walls, so East Sandgate and West Sandgate whether physical or simple gaps in the wall will certainly be older than the Castle Barbican Gate. The magnificent Newborough Bar was demolished around the 1890’s, as it was deemed a traffic hazard but this wasn’t the original Newborough Bar. The photos we have of this building are of the ‘folly building’ built in 1843. A beautiful building but constructed for ornamental purposes rather than as a defensive structure. In the photos we have of it we see it draped with advertising banners for relish and tea. The camera was invented in 1816 and photos of the original 12th Century Newborough Bar, if there are any, have yet to emerge and we have to rely on prints, drawings and paintings for images. A folly is a building, or parts of a building, made for ornamental purposes rather than functional. You can almost understand the logic of why the 1843 Newborough Bar was demolished at the advent of the tram and motor car. Other follys in Scarborough include Dean Road Jail, the Castle by the Sea buildings and Peasholm Pagoda. The first two, along with the Newborough Bar are adorned with turrets, castellations and arrow slits. Dean Road Jail even has chains for a drawbridge that never existed. There are many low status buildings in town with added decorative features, they all add to the craftsmanship of the building.